Today Rockstar Games announced new Max Payne 3 DLC, that is going to be released very soon. 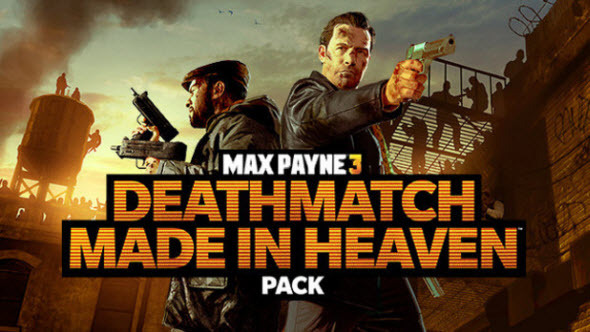 This addition got the bombastic name "Deathmatch Made in Heaven", but the developers forgot to reveal details of their new project. We know only that new Max Payne 3 DLC will add some "doozy" stuff to the cooperative mode of the game and several "awesome" gifts to those, who like Max Payne 3 multiplayer mode. Also the developers made a gentle hint at the weapon, that is going to be added to Max Payne 3 DLC. You may see new guns in the hands of our characters on the official Max Payne 3 DLC artwork. Max Payne 3 DLC release date is scheduled for 22nd of January, 2013. The addition will cost about $10 for PC gamers and the lucky people, who already have Rockstar Pass, will get Max Payne 3 DLC for free. How do you think, what interesting features will be added to Max Payne 3 DLC? Write your answers in the comments below and don't forget, that in our Facebook community there are a lot of other gaming content.